ETP partners from concept to product. With extensive experience in ion optics, magnetic modelling, instrumentation, vacuum science, engineering and manufacturing we can provide development-to-manufacture of your instrument ion detection system. ETP works with mass spectrometer companies to design, develop, and manufacture the best ion detection systems available. The team includes physicists, electronics designers, engineers and operations professionals. A development project is typically assigned to an experienced team of R&D Management, Physicists, Material Scientists, Mechanical Engineers, Electronics Engineers, Production Engineers, Toolmakers and Assemblers. 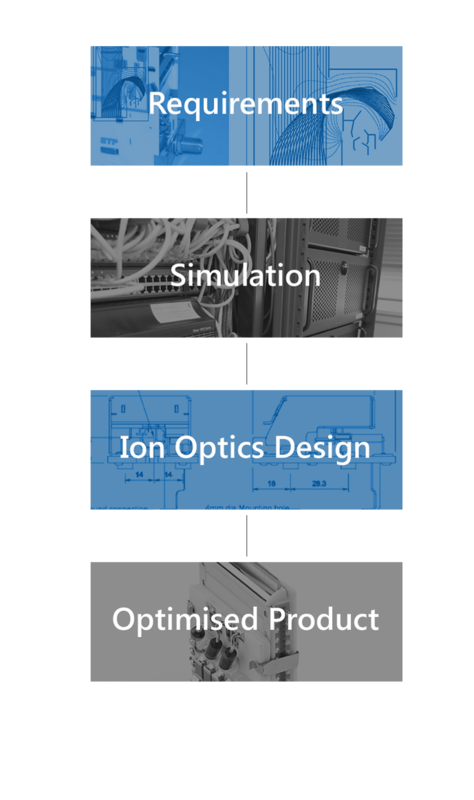 ETP has invested extensively in the development of electron optic software to meet the unique challenges of modern multiplier design. The software can be configured to rapidly model and analyse design scenarios. We know how much you rely on the technology delivered by an OEM partner. That’s why ETP starts with stable technology platforms and then offers a range of services from planning and product introduction, to solution end-of-life with visibility into product and technology roadmaps. As an OEM, you’re under a lot of pressure to keep up with the demands of your customer base. ETP helps OEMs compete by reducing research and development (R&D), testing, support, and operations costs, while speeding your time-to-market with a complete portfolio of world-class solutions and support.